What a difference two weeks make! Since exiting March without any amount of snowfall for the first time in recorded history, southern Minnesota has experienced plenty of sun and warm weather. While last week’s temperatures were a bit warmer than usual for early April in the mid- to high 70’s, this week’s temperatures have been hovering in the more characteristic 50’s and low 60’s. Our first significant April shower occurred this past Tuesday 4/6, providing St. Peter lawns and gardens with 0.33 inches of rain. More rain might be on its way by the end of next week, but until then it appears we’re in store for more sunny days in the 60’s and maybe even 70’s again. The warm temperatures coupled with some rain in April equates to flowers, and sure enough our annuals, perennials, and biennials have begun springing out of the ground (so that’s where this season gets its name). Across the college campus right now you can find the bright yellow flowers of forsythia shrubs in full bloom, along with a smattering of small early-blooming annuals. 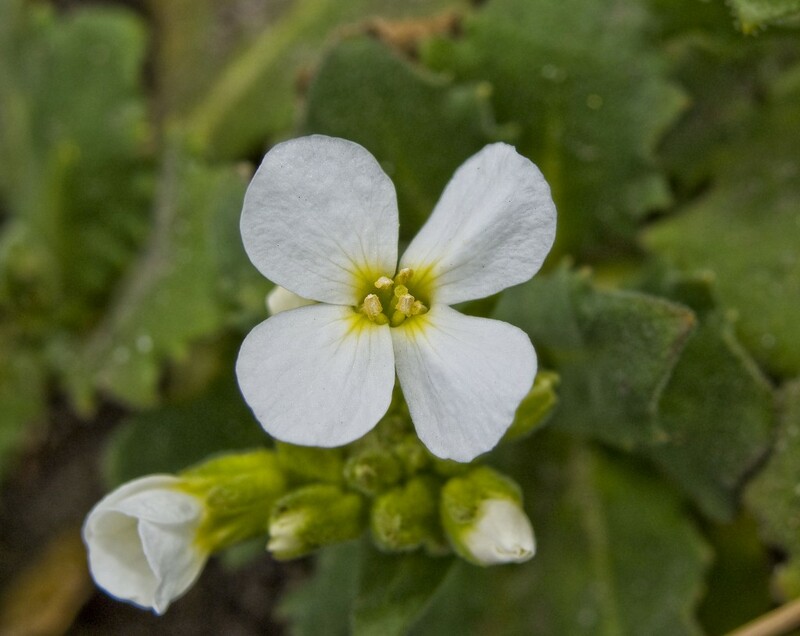 In the perennial gardens behind the Interpretive Center, the first plant to bloom was rock cress (a member of the mustard family) which began showing off its small white blooms last week. Rock Cress blooming in Evelyn Young Gardens behind Interpretive Center, 4/5/10.